IRCTC cancellation charges have been changed and now the amount deducted at the time of cancellation will be charged as per updated rules before refunding you the money used to book train tickets online. The process of ticket cancellation on irctc is simple. But as a railway user you should know how much amount is charged as a penalty when you cancel your reserved railway ticket online. 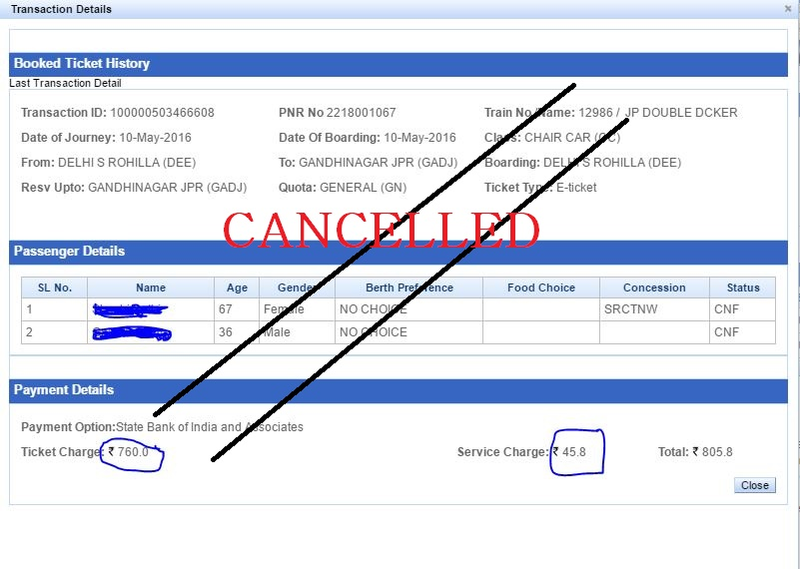 When you cancel your tickets online, two types of charges/deductions are made before refunding you remaining amount. These are services charges levied by IRCTC and deductions as per railway rules. Also note that for a normal railway user, the e-ticket (a type of railway ticket which you usually book online on www.irctc.co.in) can be cancelled only before the train chart preparation which usually happens 4 hours before the scheduled departure of a train from the starting(source) station. If you cancel a confirmed train ticket more than 48 hrs before the scheduled departure of the train, flat cancellation charges shall be deducted @ Rs.120/- for AC 1st Class/Executive Class, Rs.100/- for AC 2 Tier/First Class, Rs. 90 for AC 3 Tier/AC Chair car/ AC 3 Economy, Rs.60/- for Sleeper Class and Rs.30/- for Second Class. If a confirmed ticket is cancelled within 48 hrs and up to 6 hours before the scheduled departure of the train, cancellation charges shall be 25% of the fare subject to the minimum flat rate mentioned in the above clause. Less than 6 hours before the schedule departure of the train up to chart preparation of the train, 50% of the fare paid subject to the minimum cancellation charges.Note the Chart preparation time is the time for the chart preparation from the Train Originating Station or from the Previous chart Preparation station. If a chart is already prepared you have to file a TDR (Ticket Depository Receipt) online on IRCTC by going to services section on irctc.co.in and by choosing 'File TDR' under 'My Transactions' there in. IRCTC will forward the request to concerned railways and will refund your amount back to your account after making deductions as per Indian Railways rules and after applying cancellation charges. 1. 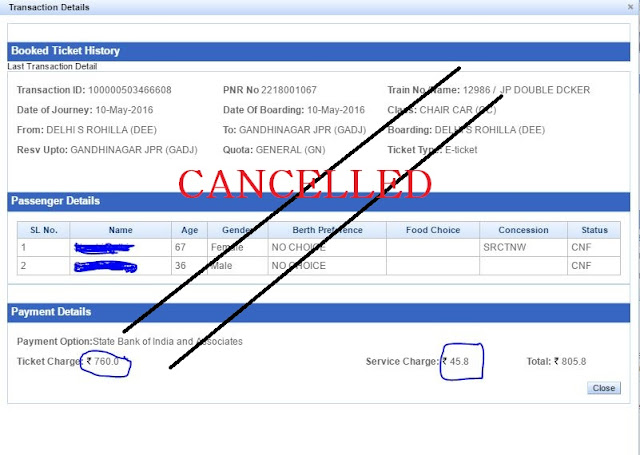 No refund shall be granted on the confirmed ticket after four hours before the scheduled departure of the train. 2. No refund shall be granted on the RAC or Waitlisted ticket after 30 minutes before the scheduled departure of the train. 3. In case, on a party e-ticket or a family e-ticket issued for travel of more than one passenger, some passengers have confirmed reservation and others are on RAC or waiting list, full refund of fare , less clerkage, shall be admissible for confirmed passengers also subject to the condition that the ticket shall be cancelled online or online TDR shall be filed for all the passengers up to thirty minutes before the scheduled departure of the train. 4. For further details, please refer New refund rules 2015 w.e.f 12-Nov-2015.